Mining is described as the process of physically removing minerals, rock, or ore from the earth's surface. This includes underground mining and surface mining. Archeological discoveries prove that stone mining was performed in prehistoric times. The people of the Stone Age dug for flint to make scrapers, knives, and arrowheads. From about 8000 to 2000 B.C. shafts up to 330 feet deep were dug into soft rock deposits in France and Britain in order to extract flint. The oldest known underground mine in the world was dug around 4100 B.C. in Swaziland It was for hematite which contained ochre, which they used for body paint and in burial ceremonies. Gold was probably one of the first metals mined from streambeds of sand and gravel. The gold mines of Nubia were among the largest and most extensive of any in Ancient Egypt. But copper was the first metal that humans learned to shape. According to historians, copper was mined by the Egyptians on the Sinai Peninsula in 3000 B.C. Silver was soon found and at one time was considered more valuable than gold. Lead was discovered about 2500 B.C. in the ancient ruins of Troy. The Romans built aqueducts that increased mining by bringing water to them, which powered simple machinery. Still, in the Middle Ages soft ore and rock was still mined by hand with a pick. Harder rocks and ore with a pick and hammer, wedges, or heat. The practice was to pile logs at the rock face and set them on fire. The heat would cause the rocks to crack. Black powder was first used in what is now known as Slovakia in 1627. Mining methods really did not change much until mechanical drills powered by compressed air were invented in the early 1800's. Holes could be drilled and loaded with dynamite. Various other types of mechanical mining equipment were invented, greatly increasing production. Also in the 1800's major growth occurred in the mining industry in the Americas led by the California Gold Rush in 1849 and the discovery of Nevada's Comstock Lode silver deposits a decade later. Coal, copper and other materials were in great demand. We were moving into the Industrial Revolution. Underground mining becomes necessary when the ore is so deep as to make removing the top rock impossible. Underground mining is much more expensive, and much more dangerous. Production can be as much as 50% less than in a surface mine in the same time period. Usually in an underground mine the first step is to sink a "shaft" to a depth just below the deepest planned mining area. Then horizontal openings are dug along the shaft to the ore. Mining technology today has advanced to the point where underground mines are at depths of 12,000 feet and surface mines can be up to 3000 feet deep. The deepest mines in the world are gold mines in the Witwatersrand region of South Africa, which are currently working at depths over 12,100 feet. The Bingham Copper Mine in Utah is currently 2.5 miles across and .5 mile deep and is the largest open-pit mine in the world. The larger open-pit mines can move almost one million tons of rock per day. Obviously these types of stone mines are limited to major corporations with lots of resources. Surprisingly there are still individual prospectors out there looking for ore. Most public lands administered by the BLM and the U.S. Forest Service are open to mining claims. 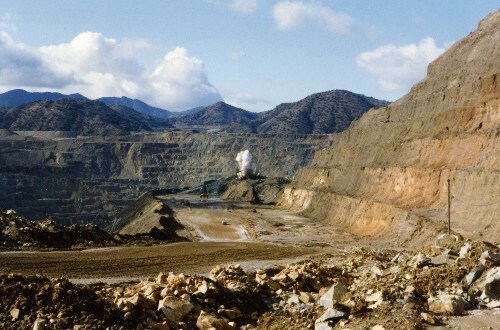 Privately owned lands, trust lands, sovereign lands, national parks and monuments, as well as Indian and military reservations, are excluded from mining claims. Though sometimes you can work out a deal with a private land owner. The General Mining Law of 1872 states that public lands of the United States shall be free and open to exploration and purchase. This means that anyone who is a U.S. Citizen (or declared an intention to become one) over the age of 18 can hold a mining claim on public lands. A corporation is considered a citizen. There is no limit on the amount of claims you may hold. In 1998 the Bureau had on record approximately 290,000 mining claims nationwide, including Alaska. Of course there are lots of exceptions and requirements. For more information please refer to your states Bureau of Land Management. In recent years there has been a great furor over environmental issues, and over the fact that other than fees, the U.S. taxpayers make no money off the mines on public land. However, according to the BLM's Public Land Statement for the fiscal year 2004, sales of land and materials brought in $570,864,571, claims holding fees and service charges generated $17,843,412 and mineral royalties generated $2,394,077,846. In any event, with the reduction of open land, and with the cost of filing, the cost of equipment, and the difficulty in getting labor, it is getting harder for a small business or independent miner to make a living off mining. Especially since there are no guarantees that the mine will even produce what you hope. Unfortunately when large corporations are mining for ore, such as copper, they do not bother with the gemstone material, and lots of beautiful minerals and gemstones materials have been crushed or leached and are gone to us forever.